Our delicious and gluten free corn chips are available hand cooked and lightly salted or raw cut. We offer a vast range of freshly baked, authentic Mexican style tortillas to satisfy the increasing demand for high-quality Southern Californian & Mexican style foods. Founded over 20 years ago, we have developed our recipes and processes to continue delivering the best tortillas on the market. Our range includes soft, pliable and ready to use wraps destined for your Café or Restaurant. 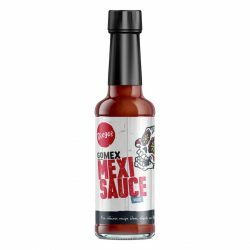 We stock a range of carefully developed and selected authentic Mexican and American Condiments, spices, flours and other ingredients that compliment the Mexican - American wave of authentic high quality Southern Californian, Baja and Mexican style food. Our range includes soft, pliable and ready to use wraps destined for your shop. Our Raj’s Chapati range comes in three different flavours. These Indian style Chapati are soft, pliable and Australian Made. 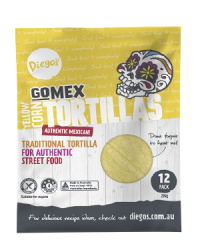 Our Corn Tortillas are free from wheat, gluten, nuts, dairy, yeast, soy, GMO & artificial flavours. Eye catching dish that everyone would like to munch on. Hassle free to prepare too. Using a fork roughly mash avocado's. Season with salt and pepper to taste, stir in lime juice, add Jalapeños and coriander. Mix sour cream and 2 tbsp of MexiSauce. Using a litre size bowl, add refried beans and press down slightly. Add avocado, press down slightly. Top with tomato, olives, coriander. Cut corn tortilla's into 6 triangles. Deep fry corn tortilla's for 2-3 minutes or until golden and crispy. Drain off excess oil with paper towel and sprinkle with salt and smoked paprika. Garnish dip with a few corn chips and have the rest on the side. Tip: Try baking corn tortilla’s in the oven for a healthier option. Dip can be made the day before its needed and refrigerated, corn chips can be fried the day before and stored in an airtight container. Try using refried beans with chipotle direct from Diego’s.